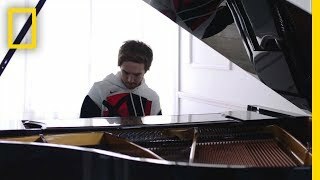 National Geographic teamed up with Grammy Award-winning DJ and producer ZEDD to create an original song inspired by the landmark show One Strange Rock, from executive producer Darren Aronofsky. Zedd was always a fan of Darren Aronofsky and was inspired by the visual palette of the show. By setting up projectors within an artificial cave in the Hollywood Hills, Zedd’s music comes to life in a unique projected AR performance. Footage from One Strange Rock is projected onto rock and stone, giving the performance a holographic-esque vibe. 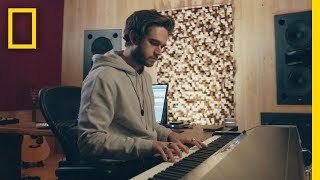 Just a day after filming the video, Zedd sits down in the recording studio of his former L.A. home to explain his music-writing process. This time, he’s minus a baby grand, flanked instead by a keyboard and massive computer monitor.